30% Tinosporasides from Giloy - Antioxidant, hepatoprotective, effective in drug induced liver injury, prevents immunosuppression, minimize liver toxicity, removes excessive fat. 2% Glycosides from Punarnava - Diuretic herb, it removes excess of fat, water from within the body. It rejuvenates liver, that's why the name is punarnava. 5% Flavonoids from Arlu - Hepatoprotective, Significant reduction of the elevated enzyme levels of serum glutamate oxaloacetate transaminase, serum glutamate pyruvate transaminase and serum alkaline phosphatase. 1(one) Capsule twice daily or as recommended by your healthcare professional. 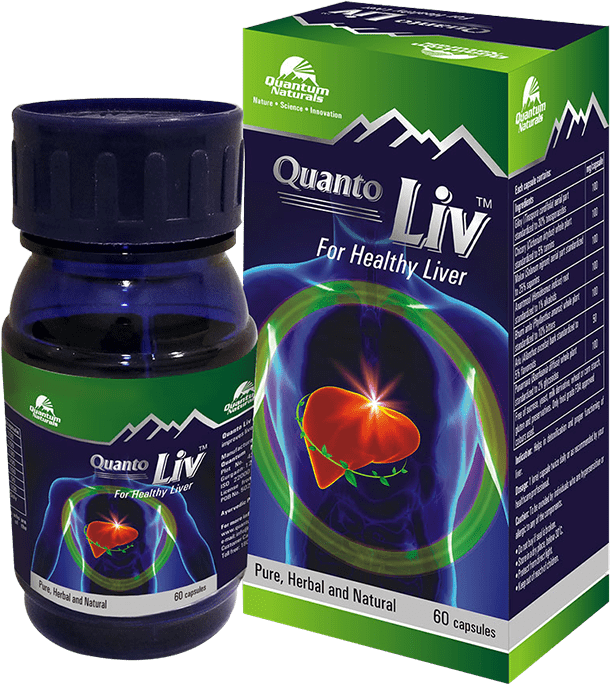 Quanto Liv is a potent herbal formulation which acts as Hepatoprotective, helps in regeneration of liver cells, and protects the liver against various drug, toxins and alcoholic induced toxicity. Quanto liv is also helpful in jaundice and fatty liver. 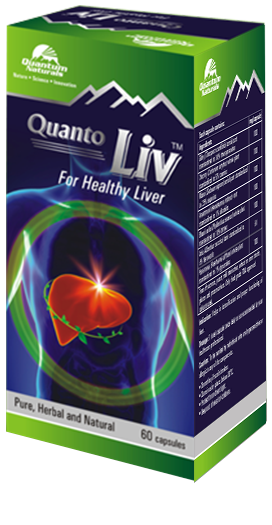 Quanto Liv ensures healthy functioning of liver. Quanto Liv is 100% natural, free from chemicals and heavy metals. Giloy (Tinosporia Cordifolia) is also known as AMRITA which means "the Root Of Immortality" because of its abundant medicinal properties. Giloy removes toxins, purifies blood, fight bacteria that causes diseases and combat liver diseases and rejuvenate liver. Chicory (Cichorium intybus) is a woody herbaceous plant that has a wealth of health benefits .Chicory increases bile secretion. Chicory root helps to achieve optimal liver and Gall Bladder health by treating liver and gallbladder disorders. It treats loss of appetite and upset stomach. Makoi (Solanum nigrum) is a perennial herb from the Family Solanaceace. It has Anti-inflammatory action. It helps in managing fatty liver and normalise symptom due to alcohol. Anantmool (Hemidismus indicus) belong to Family Asclepiadaceae. Alkaloid present in it is Tylophorine. It has Hepatoprotective properties against chemical hepatotoxicity, effective in liver injury and Jaundice. Arlu (Ailanthus Excelsea) is a large deciduous tree of Family Simaroubaceae, commonly known as Sonpatha. Arlu increases appetite. Arlu has blood purifier properties. It acts as Hepatoprotective. Punarnava (Boerhaavia diffusa) is a miracle herb. Punarnava acts as liver tonic and used to treat all liver diseases. It rejuvenates liver that's why the name is punarnava. Are there any drug interaction with Quanto Liv? 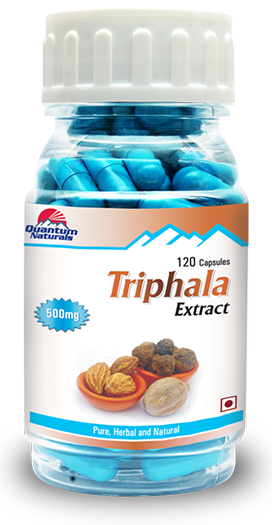 No there is no drug interaction of this product with any kind of medicines, you can take with your prescribed medicine of any clinical disease condition. Does Quanto Liv cause any side effects? There are no reported side effects with the use of Quanto Liv. In case of any adverse reaction, please consult your healthcare professional. 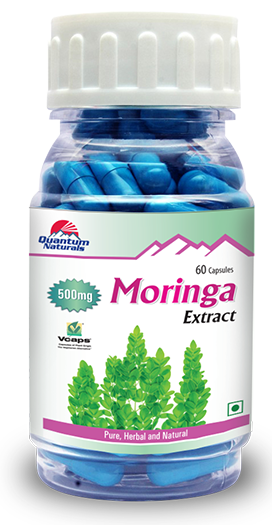 1 capsule twice daily or as recommended by your healthcare professional. Is a specific lifestyle change required to be followed? Regular exercise is recommended like brisk walking, gyming, and yoga at least for 45 min per day to maintain your ideal body weight to avoid conditions leading to fatty liver and associated problems. Is there any specific diet need to be followed during the course period? Moderate exercise employed for the elderly to avoid conditions leading to fatty liver and liver associated problems. And for reducing risk of scarring and cirrhosis in Hepatitis C.
Can one smoke or consume alcohol during the treatment of Quanto Liv? No smoking and alcohol as it cause the inflammation and scaring of liver which damages the active cells of liver. Can Quanto Liv be consumed with prescribed medicines? If you are pregnant, nursing, taking medication or have a medical condition, consult your healthcare professional before using this product. How long should one continue taking Quanto liv? Quanto liv is safe formulation and can be taken for long duration.